Here’s an idea for people who are fortunate enough to have computer access. If you are in a one-to-one school, or even if you have a class set of iPads, this is something to try! 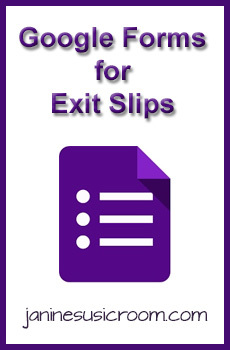 Instead of a paper exit slip, email the students a link to a short Google Form. There are several options for question types, and you can even prompt the students with pictures or YouTube videos. The genius in this system is that you can see all the responses in a single document! With this system I can quickly highlight or color-code to give an overview of the level of understanding in each of my classes. I’ve just started doing this, but I’m really excited about the potential.